^ "Miranda Richardson as "Queenie" (Elizabeth I) in Blackadder II (1986) | From The Tudors to The Crown: British royals in TV & film - On demand". Telegraph.co.uk. Retrieved 30 August 2018. ^ "Blackadder II: Truth Vs Fiction | Blackadder | Yesterday Channel". Yesterday.uktv.co.uk. 6 April 2017. Retrieved 30 August 2018. ^ Marcus Williamson (24 June 2014). "Patsy Byrne: Nursie in 'Blackadder II' who originally made her name on the stage, acclaimed by such critics as Kenneth Tynan". The Independent. Retrieved 30 August 2018. ^ "Blackadder, Chains". BBC. Retrieved 19 July 2009. 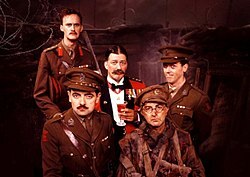 ^ "Blackadder interviews". BBC. Retrieved 19 July 2009.